I’ve put a lot of thought to this whole dressing like it’s fall when it feels like summer thing and I think I’ve found the solution: dark colors, bare limbs, no layers. Those are the rules of fall here in the south. Love this outfit! You are a daily inspiration! love this look! your hair looks amazing by the way! I just came home from London to Florida and the weather has been quite drastic… I mean I was all fall-ed out and the second I got off the plane… took off layer by layer in rapid speed! I am still having a hard time giving up the bright colors. Especially considering it is still hot enough in Dallas that I am still able to swim in the evenings. But I am slowly coming around and parting with my summer attire, much to my chagrin. Yay for bare limbs though! And YOU’RE my favorite! I think you nailed the Southern Fall look. It’s so hot here in Florida and I’m so excited for Autumn dressing… I’m gonna have to give your tips a try. I want sooo badly to pull out my sweaters, but I know if I do I might spontaneously combust. Tried to wear a cardigan today, and wound up taking it off after like, 20 minutes. Love this outfit, Kendi! Graphic tees are my favorite. So cute! That shirt is awesome! Also pie days sound awesome too! Love the combo of the skirt and the shirt. that shirt is awesome! you look fantastic! Ooh… pie… and that tee.. both are winners! Sounds like a home run weekend! I love the tweed skirt paired with the tshirt! And I’m super jealous Friday will now be Pie-day for you! Love the tee and it looks so cute with that skirt! You made that cool tee look super chic, you take effortless chic to a whole new level pretty lady! Adore those heels. Love the outfit, as always! I was hoping one day you could do a post on the makeup brands/colours you use. Your makeup is sensational and we have similar colouring, so I’d love to copy it! Emporium Pies is SO great! Their shop in Bishop Arts is just adorable. I imagine the McKinney location will be just as fabulous! Lucky you! Love the outfit as always! I would have never thought that metallic silver heels would look so great in the daytime! Love this! Emporium pies are so delish. And now I want one. Or three. You look great. Cute necklace. I’m in love with the dressed down silver heels. Love this combo! Especially that bloom skirt! You look great! Cute outfit! Love your shirt and skirt! Those are my styling thoughts exactly, I live in FL it is HOT outside. I love this look, it’s the perfect mix of feminine, edgy, dressy and casual! love it. thanks for the outfit inspiration! Love the combination of the skirt & tee! such a fun t shirt! and i’m crazy about that skirt! I'm in love with the dressed down silver heels. Love that top! You look so great! I’m all about these tees with words on them lately. I need to find one of my own. Great pairing with the skirt, too! I am loving that top with the tweed skirt! Such a great look! Those are my styling thoughts exactly, I live in FL it is HOT outside. I love this look, it's the perfect mix of feminine, edgy, dressy and casual! Love how you styled that shirt! What size is it? Thanks! I love silver shoes! They are the best. such a fun t shirt! and i'm crazy about that skirt! I'm all about these tees with words on them lately. I need to find one of my own. Great pairing with the skirt, too! I love that tee! And am amazed that those heels are from target!!! 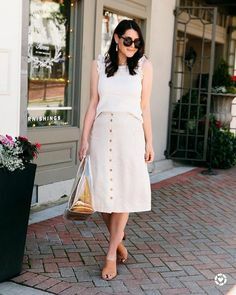 It is a great transition outfit from summer to fall. Great outfit. Love the tee!!!!! Loving the silver shoes and loving the fact that they’re from Target even more! Love your jewelry in this look! So simple and chic. You’re adorable and love that top. What size are you wearing for the T-shirt? Did you size up for the relaxed fit? Loving the silver shoes and loving the fact that they're from Target even more! You're adorable and love that top. Love that shirt, and that statement necklace! I am in LOVE with that top! It’s great!! I am in LOVE with that top! It's great!! I love that you dressed up your graphic tee in a super chic way! That skirt is absolutely amazing on you. I read your blog because I love the things you say & the way you write, but generally I feel a bit bummed because your style is way more preppy and colorful than mine (not insulting you, just saying I can’t really copy your outfits). This outfit, however, may have possibly made me shout “Yes!” in my mind. I’m not going to be someone who insists that you dress differently than your own style just so I can see it, that’s silly, but I do hope that, if you enjoyed this outfit, you’ll post some edgier looks in the future too. Either way, you pulled this off well, and I look forward to reading more of your intelligently funny posts! I read your blog because I love the things you say & the way you write, but generally I feel a bit bummed because your style is way more preppy and colorful than mine (not insulting you, just saying I can't really copy your outfits). This outfit, however, may have possibly made me shout "Yes!" in my mind. I'm not going to be someone who insists that you dress differently than your own style just so I can see it, that's silly, but I do hope that, if you enjoyed this outfit, you'll post some edgier looks in the future too. Either way, you pulled this off well, and I look forward to reading more of your intelligently funny posts! had difficulty clearing my thoughts in getting my ideas out. I love this tee with the frilly skirt! You styled it beautifully and it looks so effortless!